generates APIs that click into client apps. Full-featured OpenAPI editor with content assist, customizable templates, outline navigation & more for fast, focused API design. Live documentation view gives you immediate clarity & insight from the API user's perspective. Interactive diagram lets you visualize the API as you design. Generate & view in any browser to give API users a fast, intuitive overview. Split a large Swagger API spec into multiple files, even share & reuse API components across projects & teams! Edit, navigate, document & generate, all fully compliant with OpenAPI standards. Consolidate & simplify complex multi-file projects to a single file, for easy downstream code generation & docs presentation. 70+ built-in generators including full Swagger-Codegen support. Create implementation scaffolds, client libraries, documentation & more. Generate from the command line, the IDE, or your CI/CD automated build platform. Build your own generators or customize one of ours. The integrated GenTemplate framework lets you create advanced API codegen solutions. Turn on the mock service for instant access to a simulated API, running on your own workstation. Add example messages to complete the mock service with sample request and response payloads. Test with the live Swagger-UI view, the Curl command line, your browser, or the API testing tool of your choice. Full GitHub Support lets you branch, merge, commit, manage issues and pull requests, right from the IDE. Cloud-based or on-premises version control. Your choice. Plug-in support for Git, Bitbucket, Perforce, Subversion & other VCS platforms. Integrated issue tracking & build automation. Built on Eclipse, API Studio supports plug-ins for popular ALM tools continuous delivery platforms. Flying first-class with API-first. RepreZen API Studio brings API-first design & development right into the development environment, first-class. Installs standalone or from Eclipse Marketplace into your IDE with the same full feature set. Your APIs, your platform. No limits. RepreZen works with your intranet, local filesystem, even multiple monitors! And there are no limits on the number of APIs & resources you can create. "I really dig the ability to graph out all of the resources and URIs, test the API from a built-in mock service, and generate documentation for the entire API solution." "RepreZen API Studio empowers software teams to define their API contracts, specifying the standard models, methods and patterns that make their APIs work together." "API Studio is ideal for large teams of developers, where the integration strategy needs to be orchestrated and communicated independent of implementation details." Nice island. Where's the bridge? Siloed development teams working in isolation? Difficulty modeling your world as microservices? Client application developers slow to adopt, struggling to integrate? enabling deep API interoperability across the enterprise. Developers work with APIs in combination, not in isolation. No API is an island, and consistent data representation is most often the missing link. RepreZen API Studio offers RAPID‑ML as a domain-driven modeling language for strategic API design. RAPID‑ML is easy to read, highly expressive, and maps directly to OpenAPI. You get powerful, adaptive data standardization, with full compatibility. Just the right flexibility to bend, without breaking. 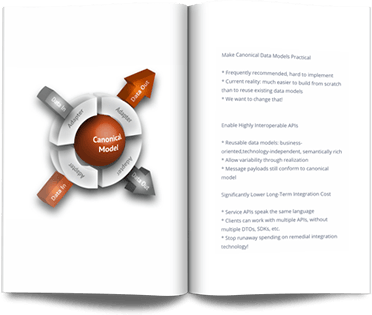 Canonical data models need to adapt to the context in which they're used. RAPID‑ML replaces rigid schemas with flexible coupling, so API developers can collaborate and converge on shared data definitions. APIs can vary within well-defined limits, but still conform. Finally, data model reuse becomes the practical choice for busy developers. Lower your long-term integration costs, and integrate faster. APIs that speak the same language are easier to comprehend, faster to integrate. RAPID-ML addresses data model mismatch at the source, so APIs 'click' with client applications. "RepreZen API Studio is the tool we need to design and document our REST APIs. The modeling environment is very intuitive, so we can focus on the architecture and functionality of our API resource model." See how API Studio turns your API description into a dynamic visualization, making it easier than ever to comprehend, communicate and analyze your API design. A canonical data model describes a shared understanding of your business domain. Done right, this model can be a workhorse for your team, facilitating communication, guiding schema design and data transformations. You don't need endless meetings or expensive tools to get real value from a shared data model. This hands-on guide will start you down the right path, today. A lightweight method for building and evolving a canonical data model. What tools to use, what kinds of details to capture, and what to leave out. Getting commitment and maximizing value from key participants. Organizing a collaborative workspace and change management workflow. Applying the canonical data model in practice.